This is very exciting!! I love it. Keep experimenting and trying new things. You are an inspiration. Qiang, I am always so impressed with your demo paintings! How you paint so well under pressure is beyond me. These last 3 are really wonderful. I hope you're doing well and enjoying your current workshop!! I love this one, but think that the shadow is too dark and I can't see anything in it. I think that Carol Marine could comment more about "life" in the shadow. Love it! I'm really caught by your work, the colour, the tone, and your brush work...great painting! I've always followed your work, but it just got more exciting. And I LOVE that you are able to express so clearly what's happening at the same time. Simply stunning. The light is so powerful in this painting! This painting really jumps out to me--I had to comment on this one. The light is absolutely captivating, and the variety in the shadow areas is wonderful. Lovely piece. These pears are amazing! 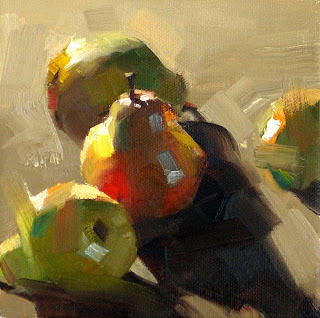 Your direct and deliberate brush skills coupled with the rich, bold color make for a striking painting.